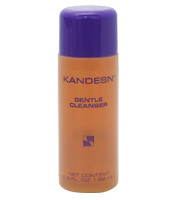 Kandesn Gentle Cleanser is ideal for sensitive skin; however, the formula is designed for all skin types. It will not aggravate oily, sensitive, irritated, or acne-prone skin. Superior, concentrated herbal extracts in Kandesn Gentle Cleanser soothes the skin while cleansing it. Superior, concentrated herbal extracts in Kandesn® Gentle Cleanser soothes the skin while cleansing it. The slightly acidic formula is designed to be in balance with the skin’s natural pH, which helps balance the skin’s crucial oil-to-water ratio. Be the first to review “KANDESN GENTLE CLEANSER” Click here to cancel reply.